Take a nostalgia trip with our fantastic quality, cinema style popcorn machines. The enchanting smell of freshly made popcorn will remind your customers of the excitement and enjoyment of the cinema. 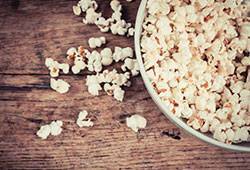 With one of the highest mark-ups of any foodstuff, popcorn has been making business owners happy for decades. Our popcorn makers have a huge 8oz capacity and come constructed from solid stainless steel. Our popcorn machines also feature a swing lid to avoid spillages, a heat light to keep the popcorn toasty and a handy drawer for easy removal of those pesky un-popped kernels. Our popcorn machines are all covered by our MonsterShop warranty.